Sun Salutation is a common warm up in the asana yoga practice, especially Vinyasa, Power and Ashtanga-style classes. You will often repeat anywhere from from 3 to 10 cycles of Sun Salutation, so it’s crucial that your form is correct to prevent injury and get the most out of your practice. Here are five common misalignments in Sun Salutations and what you can do to fix them. Tadasana or Mountain pose is the basis of all standing poses. You definitely want to find correct form here so you have a good set up for the rest of your postures. 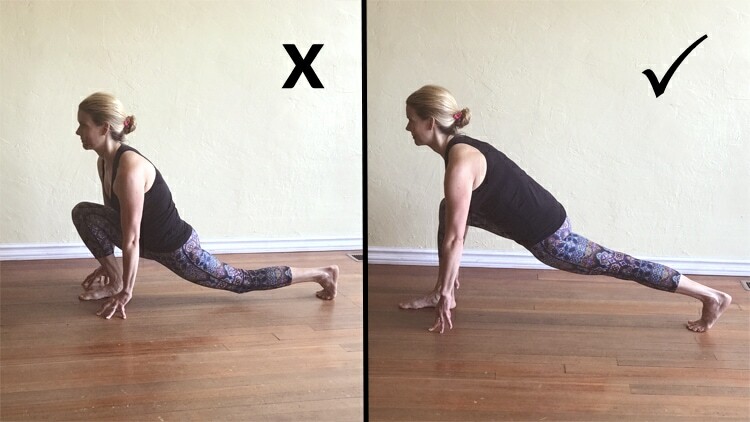 Common mistakes I see in Mountain pose include falling back into the heels and locking the knees. I also notice students let their shoulders round forward and hands relax in front of the legs. I see the abs relax and the chest cave in, as well as the head move too far forward. 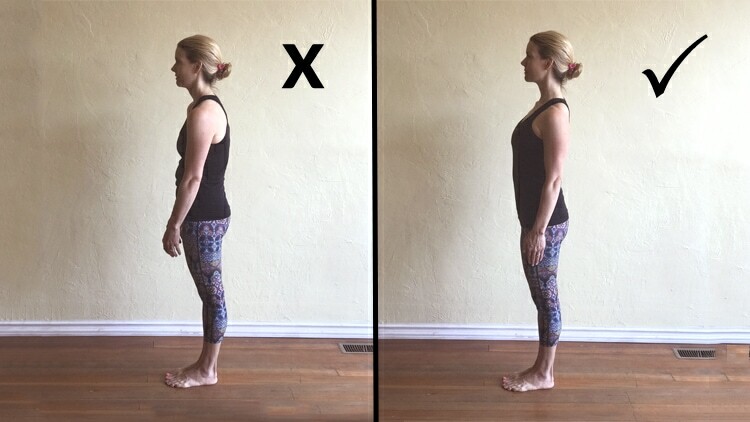 How to Fix It: Stand tall with feet together and press firmly into your feet. Don’t lock your knees or let your weight fall back into your heels. Keep your chest lifted and your abdominals engaged. Keep your arms back in line with your hips and your shoulders open. 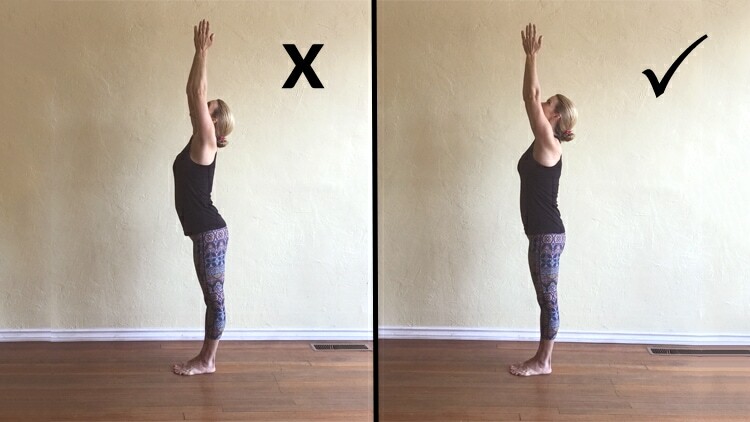 When you lift the arms up overhead before swan-diving forward, it’s easy to shrug the shoulders and lose the good form you set up in Mountain pose. You can easily fall back in to your heels, jut your front ribs forward, throw the head too far back, and lose sight of the abdominals. How to Fix It: Keep the abs engaged, soften the front ribs back in space, make sure the tops of the shoulders are relaxed, and your weight is even in the arches of your feet. Lunges are done all of the time in yoga and it’s crucial to do them correctly to keep the knees safe. One of the most common mistakes I see in lunges include letting the front knee move too far forward past the toes. Over time, this can put way too much pressure on the knee joint and do serious damage. I also see people letting the back knee bend instead of keeping it nice and straight. Instead of keeping the neck long and the gaze forward, you can easily lift the head too high and shrug the shoulders. How to Fix It: Make sure to step far enough or forward when lunging to keep the knee directly above the ankle. Stretch the back leg straight to lengthen the hip flexor and quad. Relax the shoulders, engage the abdominals, and press firmly through the front foot. Plank is a staple pose in all yoga practices, and it will help you build the arm and core strength you need for various postures. This is why it's very important to do it correctly. I find most students lift their hips too high—or even more commonly, drop their hips too low—in this pose. Practitioners also collapse in their shoulders and have their heads out of alignment. How to Fix It: Make sure you find one straight line of energy from your head to your heels. Imagine you could balance a teacup on your lower back. Activate your legs firmly, keep the abdominal muscles engaged and knit the front ribs. Contract the shoulders down away from the ears and press firmly in to your hands. 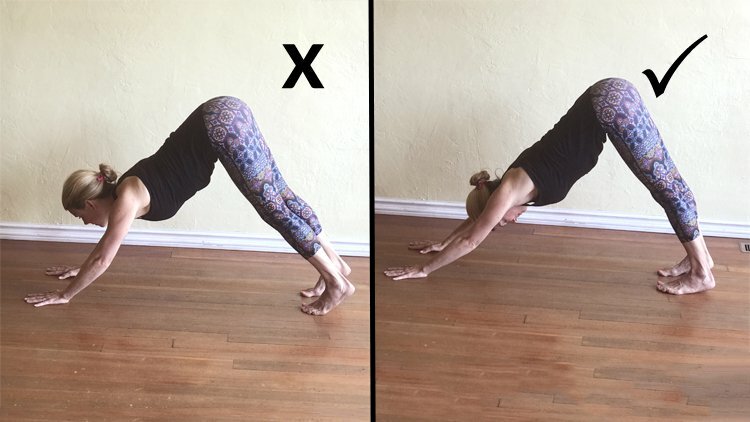 The most common mistake I see in Down Dog is students lifting their head and not letting it relax. I also see people letting their ribs splay open. Students with tight hamstrings tend to move too far forward to their hands or round in their lower back. How to Fix It: If you are super tight in your hamstrings, bend your knees to bring your torso back in space. Make sure to relax your head and gaze to your legs or belly button. Keep your core strong and press firmly through your hands. Try not to lock your elbows but keep externally rotating the upper arms outwards. Keep pressing your legs back in space and lengthen them fully, if you can keep your torso long. Sun Salutation is one of my favorite ways to start my day and practice. If you want to keep practicing yoga for a lifetime, make sure to correct your form as you flow through the steps. Namaste!